is worth reading slowly, yes? *last spring dw & i traveled with some friends to nashville to run a half marathon. we found a random hole in the wall viet joint outside of the city and they had the best bò kho i have ever had. we went there 2x. this is my attempt at recreating that dish. i have failed. however, this version is still pretty good and perfect for the vicious winter we’re dealing with. it takes time for the flavors to meld. i made it one day and didn’t eat it until the next, because like all good stews, it’s always better as a leftover. **i used two recipes for reference, though on the day of cooking, i winged it completely, in regards to measurements and method. the links i’ve referred have the exact details you might need. 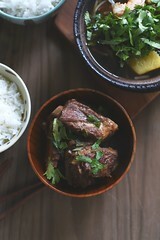 ***Luke Nguyen’s recipe intrigued me because it uses beef pho broth as its base. i love me some pho and the spices used in the stock really does add a layer of flavor. for cheater’s version of pho stock, heat up some homemade beef/veggie/chicken stock (store bought is fine too, though shoot for organic and low-sodium) with a stick of cinnamon, a few cloves and anise pods. let it simmer for an hour or so, allow the spices to infuse the stock. BAM! if you’re too lazy or time pressured, regular stock is fine, even water is fine, though the depth of flavor might be lacking. start off with the marinade – dry fry/roast the hot bap, star anise, cinnamon stick and cloves until fragrant. grind them up in a spice grinder. add the ground up spices and rice wine in a bowl. add the beef pieces and mix well. you can marinate it overnight, i let it sit for the time it took me to assemble the other ingredients and heat up the pho stock, which was about an hour. in large pot, heat up the oil along with the annatto seeds. this is for color, i’ll be honest, i don’t think it imparts much flavor to the over all dish, so if you want to skip this, i won’t judge you. when the oil reaches desired redness, discard seeds. pan fry the beef pieces until brown. do this in batches. add in the lemongrass, ginger, clove studded onion, garlic, ginger, cinnamon stick, bay leaves and prepared pho stock. mix in the tomato paste, stir well to incorporate. bring pot to a boil and the lower the heat and simmer on low for anywhere from 90 minutes to 2 hours. during the last 30 minutes, add in the carrot chunks. this should sufficiently soften them, but they will retain their shape and not get mushy. season with salt to taste, though i will say i didn’t add anything and it came out so lovely & perfectly seasoned. to serve, pour over white rice noodles (cooked according to package instructions). steamed rice is fine, as is baguette to dip is appropriate too. garnish with green scallions, thinly sliced onions, chopped cilantro, or basil. best the next day, and then the next. i hope you find yourself curled up with a good book soon! Now you’re making me feel so guilty. I have a Kindle, a credit card, and insomnia, and I have been tearing it up in the Amazon store lately. Granted I mostly read silly YA fiction in the middle of the night (see: Will Greyson, Will Greyson, etc.) but I did finish The Light Between Oceans last week. i am so glad you got my email and you have a library card now! yay for library ebooks! This is my kind of dish. On the week ends especially I love simmering something all day on the stove top or in the oven and when you finally get to enjoy it, it’s heaven. Thanks for sharing, Lan. weekend meal prep for the week is the best, stews like this one make great leftovers. I love it. The flavors here are insanely awesome. I’ve never had this dish, restaurant or otherwise! I want some. Our winter has been mostly mild but I am still knee-deep in pumpkin recipes, soups, anything with potatoes. Oh well! Noodles count ANYtime in my world. I also read very slowly. I’m working through Consider the Fork. It’s cool so far! i had a panicked moment when i saw that ingredient, but honestly, whole cardamom pods are fine. and yes, noodles anytime, any season! I finally just finished reading Eleanor and Park, actually at your recommendation. It took a while to get from the library – it was on hold FOREVER – and then I had a pile of books to read before I started it…but then promptly finished it in about three days. That, nowadays, is impressively fast! I loved the book, and it made me want to either read it again or never read anything again so that I can savour the finish of it over and over again in my mind. gasp, i love love love love that book and i am so glad that you liked it too. sometimes my taste in books is off but this particular book really hit a chord in me. i actually BOUGHT the book, i liked it so much. Its been so cold and I need some stew in the system! and it continues to be so cold! sigh. I will order this dish next time I go to the Vietnamese grill in Charlotte. Never know what to order and fall back on pho always- which is great but need variety once in a while. Which book you finished last? i can’t even remember what the last book i read was! i am currently reading a great book: The Light Between Oceans, though i’ve had to check it out THREE times already! bo kho is not always served at restaurants, i’d say it’s 1 outta 5 will have it.